Are you consistently looking for ways to improve customer service skills? If so, that is a smart and professional strategy in today’s globally competitive marketplace. Not matter what type of business or organization you belong to, developing and honing your customer service skills will put you ahead of others. The reason I say that is because many customer service representatives and employees really do not care about their job. They need a paycheck and take the first entry job opportunity which comes along to provide a steady income. This is often in the service industry. In the meantime, they are often “looking for a better job.” The result is that they are not doing themselves, their organization or their customers any real good. Instead, they are going through the motions 0f serving others. Of course, all the blame cannot be placed on the employees. Many entry level employees receive only cursory operational training (e.g. how to run a register, operate equipment, and a basic understanding of products and services offered). Virtually no time is spent on ways to improve customer service skills. To distinguish yourself from the crowd and gain a reputation as a stellar customer service professional, you should continually seek ways to improve customer service skills and knowledge. The following are five simple actions that you can take in order to deliver stellar customer service. Make yourself memorable. Customer service is a “people” business. Successful service providers know how to build interpersonal relationships with their customers. To accomplish this yourself, go the extra distance when providing customer service. Don’t just do your job as it is outlined in your job description. Instead, be proactive and identify your customer’s true needs, wants and expectations. Once you know what these are, put your knowledge of your organization’s products and services into play. Efficiently decide the best course of action to serve your customer. Along the way, be personable and create a positive image or yourself and organization. This might be done through smiling, appropriate laughter, showing an interest in what your customer says, sharing interesting or useful information, ideas or suggestions, or reacting positively to a story or information your customer shares. Whatever you do, make sure that you come across as genuinely interested or concerned. All of these strategies can help build a strong customer-provider relationship. Address customers professionally. Whether you are communicating with customers face-to-face, over the telephone, in writing or via technology, you must always be professional. Never forget that your customers come from diverse backgrounds and have differing expectations of what professional customer service look and feel like. Depending on their age, background and other individual factors, they may be more or less satisfied with your approach in serving them. Other factors come into play to influence how they receive messages that you send. These include their personal experiences, emotional mood, available time, perceptions of you and your organization, and their needs and wants. You likely will not go wrong by treating each customer in a professional and respectful manner. This includes not becoming overly familiar (e.g. using their first name without permission). To identify their preferred form of address, you might simply ask, “How would you like me to address you?” Keep in mind that using informal slang terms in references to customers (e.g. “You guys,” “Sugar/Sweetie,” or “Dude”) can irritate or offend some customers. Another potential problem area comes if you adopt and use a term that you hear a customer’s friend or family member use to refer to him or her (e.g. “Mom,” “Dad,” or “Grandma/Grandpa”). This approach can potentially result in a smaller tip, negative comment to a supervisor, or desertion to a competitor. Visit your competitors. A simple way to find how you are doing compared to other service providers is to contact your competitors in person or via technology. Note how they greet you, handle questions, and generally how they make you feel about the interaction. Pay attention to things that they do well or not so well. Make mental notes and then adjust your approach to service to match or exceed theirs. 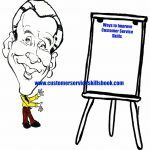 Specifically look for ways to improve customer service skills that you have or add new ones to your toolbox. Apply the 80/20 Rule. The 80/20 rule, or Pareto principle, was first suggested by management consultant Joseph M. Juran. He named the concept after Italian economist Vilfredo Pareto. Basically the rule suggests that 80 percent of effects come from 20 percent of causes. In customer service, many providers spend 80 percent of their time dealing with 20 percent of customers or similar issues. You can potentially reduce work effort by identifying these common issues in your workplace. After you have done so, work with your co-workers and supervisors to find a common solution to them. This will free up more time to allow you to focus on other customers and deliver a higher quality of service. It can also help to reduce your stress levels. To find other proven ways to improve customer service skills, read other articles on the topic in this blog. What techniques or ways to improve customer service skills do you use that might be useful to other blog readers? This entry was posted in Customer communication, Customer Service, customer service skills, delivering excellent customer service and tagged how to improve customer service skills, improving customer service, ways to improve customer service. Bookmark the permalink.